Are you someone who loves to be a trendsetter with your hair style? Well, you can be a trend setter by using water based pomades which can hold your hair style long enough! There are many ways to set the trend and hair styling is definitely right there at the top. Of course, it is not as easy and you would probably require the help of a great hair stylist to help you become a trendsetter, right? Wrong! Thanks to the advancement of technology and the wide range of pomades for hair available in the market, you can now be your own hair stylist. You can now wear a new hair style to work every day, on a holiday, for a movie, or to a date! You can flaunt undercut hairstyles, which is the stable hair trend these days or go with the man bun trend of 2010 or even get some celebrity look like the Kurt Cobain grunge style or the slick back hair style as portrayed by Michael Douglas in the movie Wall Street. So what will you be wearing today? How to find the best water based pomades ? It is not easy to find the best water based pomade from the various pomades available in the market. As each one of these pomade comes with its own pros and cons. So, we have researched and analyzed top 20 brands of pomades based on various criteria such as ingredients, price, and effectiveness and prepared a list of 7 water based pomades that will definitely enable you to make the right choice. 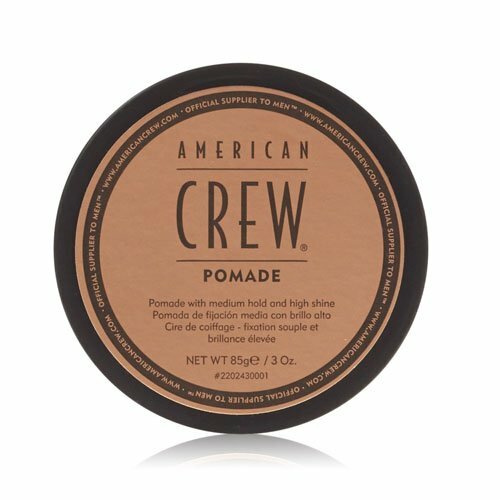 American CREW Pomade is a part of an interesting American history that revolves around iconic hair styles. If you are thinking of flaunting a pompadour hairstyle then this is definitely the best water based pomades to lay your hand on. This water based pomade contains several natural ingredients, which makes it not only a great hair styling option but healthy for use as well. One of the important ingredients is Sage or Salvia officinalis. It is an evergreen perennial sub-shrub that is native to the Mediterranean region. It is most often used in the form of extract or essential oils and is used for the darkening of hair and to reduce thinning of hair. Another interesting ingredient of this water based pompade is Ginseng root. Ginseng is a slow growing, perennial plant that is found across eastern Asia and North America. The root available in dried form has medicinal use and has also been introduced in a range of hair care products. Ginseng root in the pomade helps in strengthening your hair, removing dandruff, preventing hair loss, and protecting hair follicles. 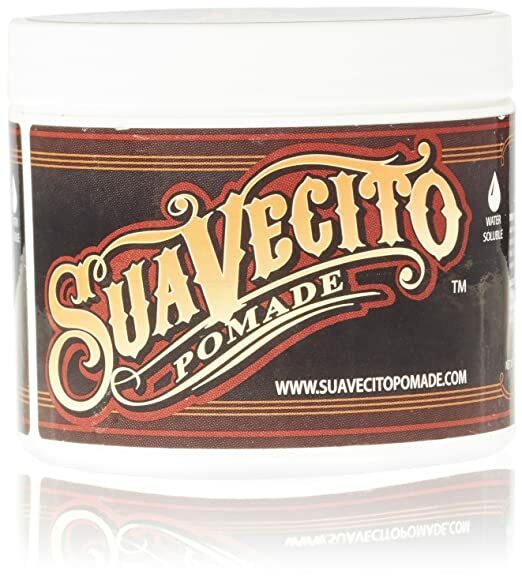 The Suavecito hair styling pomade original is water soluble and provides a strong grip when it comes to hair styling. It is just the type of pomade you need to get into the rock and roll shoes for the evening! This is considered as one of the best water based pomades because at the heart of this hair styling product is Peg-8 Beeswax. You are probably wondering what this is. It is a self-emulsifying wax that is produced through the process of etherification of free fatty acid in beeswax. Beeswax (Cera Alba) is a completely natural form of wax that is created by honey bees that belong to the genus Apis. Beeswax is a boon in disguise for people with dreadlocks as it makes maintenance of dreads almost a walk in the park. The Peg-8 Beeswax is an ingredient that displays a wide pH range tolerance and is also compatible several different types of oils. Suavecito pomade original also contains peg 40 hydrogenated castor oil, which is basically amber colored, polyethylene glycol derivative. The primary function of this castor oil is that of a surfactant, an emulsifier, and parfum or fragrance ingredient. The Layrite super hold pomade is not just a hair styling product but has a name that is often associated with the ultra classic look. The brand represents a culture that has existed since 1999 and brings in a whiff of modernity to the classic hair styles. 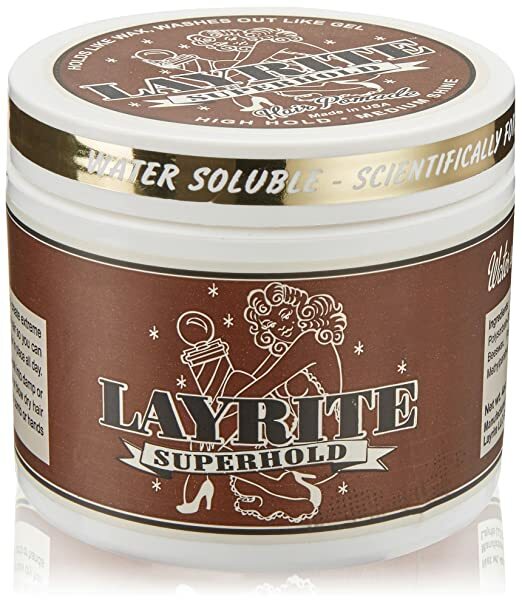 One of the primary ingredients of Layrite super hold pomade PEG-7 Glyceryl Cocoate and maybe this is the reason for the super hold it provides. Glyceryl Cocoate is made from a mix of glycerin and coconut oil and it is an oily clear liquid. It is soluble in water and alcohol and is considered a multifunctional agent. It has properties that makes it a must have ingredient in pomades and some of those properties include emollient, emulsifying, thickening, and refatting properties. It also has a good conditioning effect on hair. The other important ingredient is Hydrogenated Caster Oil. It is also known as castor wax and is produced by hydrogenation of pure castor oil. It is normally used as a solubilizer to add a small amount of oil into water based pomades. It also acts as a good emulsifier. This pomade can help in sculpting extremely thick hair, course hair, and curly hair and ensures extraordinary styles are possible. Layrite super hold pomade helps in creating high-elevation hairstyles, which require good or strong hold. It provides medium shine that is ideal for hairstyles like slick-backs, fauxhawks, messy wet looks, and even spikes. 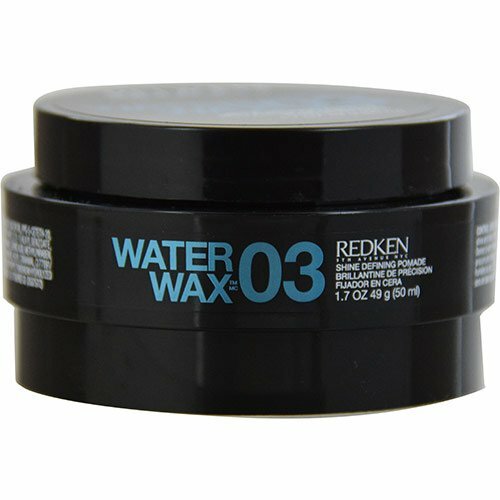 The Redken 03 water wax pomade is truly powerful water-based pomade that will help redefine your hairstyle. It is on the list of the best water based pomades because it has the ability to create bold textures and will help in bringing moist separation to your hair. The Redken 03 water wax pomade has some interesting ingredients like the hydrolyzed wheat protein. So what does this protein really do? It helps in revitalizing the natural keratin in your hair or scalp, which is responsible for the beautiful and strong hair strands. Hydrolyzed wheat protein is also known as hydrolyzed keratin that plays an important role in attracting moisture to your hair and brings about an improvement in the ability of the scalp and hair to maintain proper moisture levels. This super ingredient makes the Redken 03 one of the best water based pomades available in the market. Another interesting ingredient in the Redken 03 is hydrolyzed wheat starch. Along with hydrolyzed wheat protein, it promotes proper treatment of hair thinning and hair breakage. Wheat starch also helps in adding volume to the hair. All in all, the Redken 03 water wax pomade will not only help create attractive hair styles but also protect your hair in more ways than one. 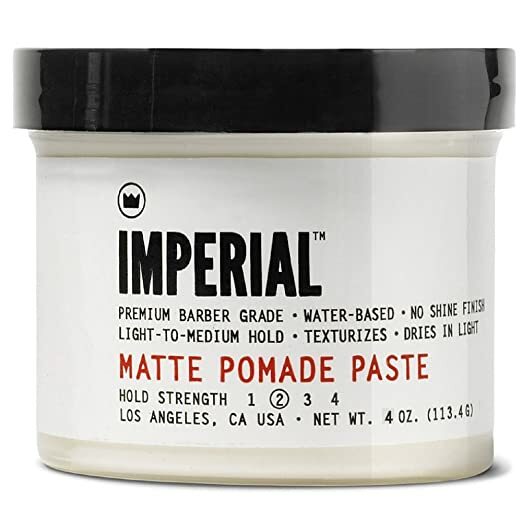 The Imperial matte water-based Hair﻿ ﻿﻿﻿pomade from Imperial Barber Products is a highly versatile hair styling product that is meant to help you recreate anything from the 1960's to the modern hair styles. The reason why it has featured in the list of best water based pomades is because this product has been designed by barbers, the people who know what hair styles is all about! The Imperial Barber Products matte pomade is a mix of natural and other ingredients that makes it stand out of the crowd. One of the natural ingredients in this pomade is sunflower seed extract. This extract is produced from the seeds of sunflower also known as Helianthus. It is a tall annual that grows across the world and is considered extremely healthy for hair. Apart from bringing shine and luster to your hair, sunflower seed extract acts as a great hair conditioner and provides the right nutrients including Vitamins A, B, C, E, iron, potassium, and calcium. The other natural ingredient used in making this pomade is Green Tea leaf extract. The health conscious people across the world love to associate themselves with consumption of green tea also known as Camellia sinensis. It definitely has several health benefits but more than that it also benefits the hair in many ways. It is a good source of Vitamin C and E, which not only stimulate hair growth but also softens hair. The all-natural ingredients in the Imperial Barber Products matte pomade that help in strengthening of hair, providing and retaining moisture, and adding volume. It doesn't weight the hair down and the paste dries in natural conditions. This is considered the perfect solution for messy and loose hair styles as well as formal business styles. If you have desperately wanted that slick Donnie Brasco hairstyle or the slicked back hairstyle sported by David Beckam then Teddy Boy Original by Anchors Hair Company is exactly what you need. This Knoxville, Tennessee brand provides a real knockout performance when it comes to boys vs. men's hairstyles. 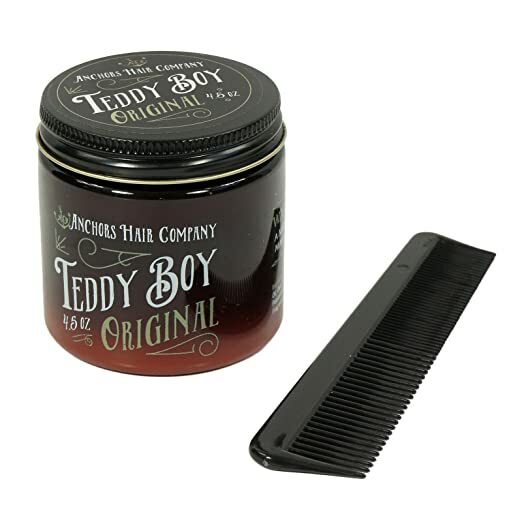 The Teddy Boy Original by Anchors Hair Company is a real herbal product as it contains a variety of natural ingredients including essential oils. One of the top ingredients in this pomade is the eucalyptus oil, which is extracted from the dried leaves of Eucalyptus globulus or the blue gum tree. Eucalyptus essential oil has several health benefits but it has been used in the pomade to provide proper nourishment to your hair. It also acts as a great moisturizer, provides relief from an itchy scalp, and improves the overall luster and health of your hair. It the powerful natural ingredients used in the Teddy Boy Original pomade by Anchors Hair Company that makes it one of the best water based pomades out there. 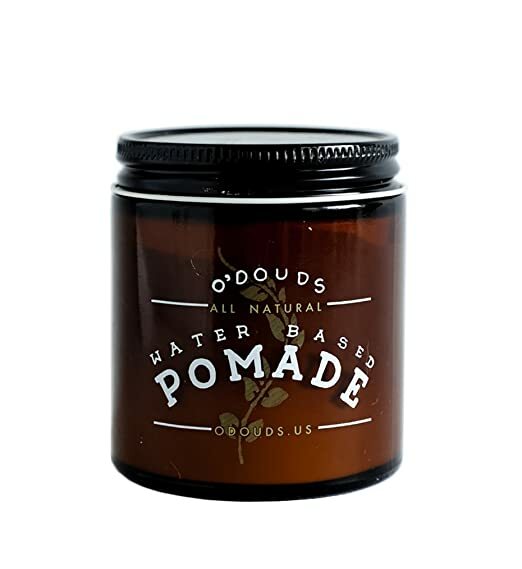 If you have been looking for pomade that is made using natural ingredients and has the ability to hold up your style through the business meeting or evening party then the O'Douds natural water based pomade is something you should try. You must be wondering what natural nutrients does this pomade really contain. Well, to start with, it contains Shea Butter. It is not exactly your typical butter but an ivory colored fat that is extracted from the fruits or nuts of Vitellaria paradoxa or the African shea tree. It's use dates back to the times of Cleopatra's Egypt and has high content of fatty acids like linoleic acid, oleic acid, palmitic acid, and stearic acid among others. The reason why it has been used in the preparation of one of the best water based pomades is because it is a great natural conditioner for hair. It also has several other benefits like soothing dry and itchy scalp, removing dandruff, protection of hair against heat and harmful UV rays, and retaining moisture. There is another ingredient in the O'Douds natural water based pomade that is great for hair and it is Jojoba Oil. It is extracted from the seeds of the jojoba plant or Simmondsia chinensis. It is also a rich source of a variety of fatty acids and works as a strong hair conditioner. It provides a cooling effect and aids in the prevention of hair loss. This pomade provides quite a firm hold and ensures your hair style doesn't fall apart even if you have a field day. The O'Douds natural water based pomade contains a generous amount of essential oils that provide rich nourishment to your hair and scalp. Talk about hair style and you just can’t do without these pomades. Each type of pomade comes with its own benefits and unique ingredients and works on a variety of hair types. They are the best water based pomades that you will find within your budget. All you have to do is choose the one good water based pomade that will give you the hair style you want!